Worky's GSA fans have been specially designed to extract smoke and gases from medium pressure systems with centrifuges and direct coupling of the motor to ensure optimum efficiency (certified to IEC 60034-30-2011) and durability. 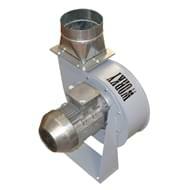 All WORKY fans have an impeller that is statically and dynamically balanced in order to eliminate vibrations and wear. The powder painted steel outer casing, the fixing feet, the double inlet, and outlet flanges make up a product that is finished and ready for installation. Only larger models require wall-mounted brackets. The product is completed with a series of control panels that enable the product to be switched on and off remotely. The electric motor is a 50Hz 2800 rpm three-phase asynchronous motor that can be connected to a 400V or 230V supply.